Nurses and other healthcare workers in Kenya have been on strike for the last three days over pay and conditions. Two days ago, the union which represents nurses (Union of Kenyan Civil Servants) reached a deal with the government and called off the strike. The nurses have refused to accept the deal that has been brokered between their union and bosses, and have walked out of work again. They claim that all the issues that had been raised had been ignored and nothing tangible had been offered in the governments deal. “We were not consulted and there is nothing that has been put on the table. They are just promises so we have said we are not going back without food on the table”. 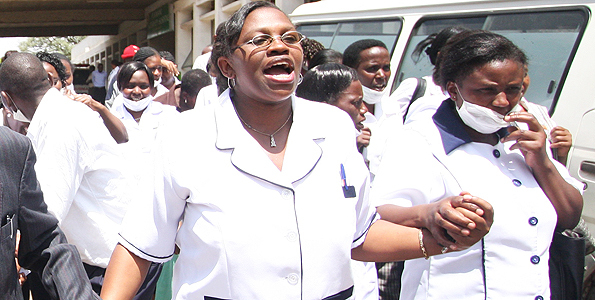 The nurses have vowed to remain on strike until their demands have been met in full. I will post updates as I find them.